The rebirth of the historic Husqvarna brand will reach a huge milestone in a matter of a few months with the launch of a three-model family of modern roadsters later this year. MCN was granted exclusive access to the latest stages of the Husqvarna project at the headquarters of Kiska Design in Austria, the company that has been behind the design of every KTM for the past 20 years and is now tasked with bringing back Husqvarna under the bold ambition of making it Europe’s third best-selling brand. The first production bikes into production will be the Vitpilen 401 and 125 models. Both share engines with parent company KTM with the 401 using the KTM 390 Duke motor, the 125 engine lifted from the 125 Duke. 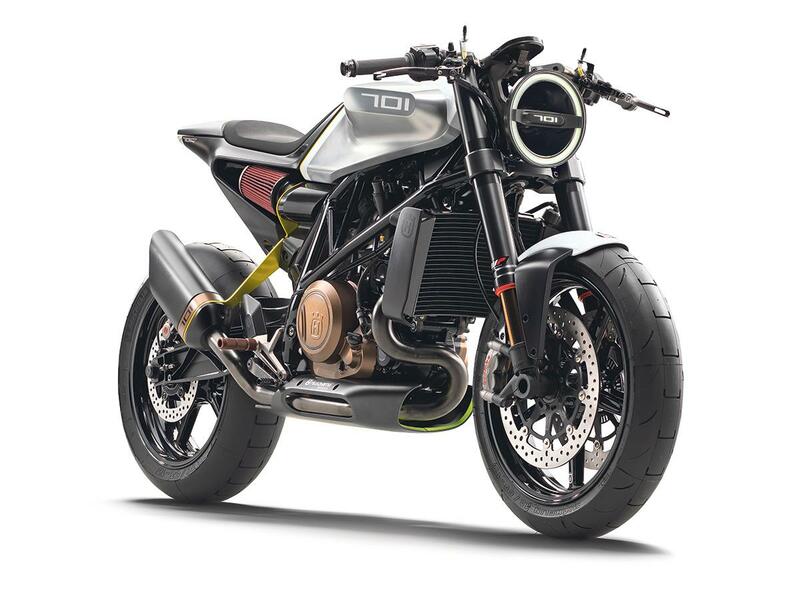 This duo will then be followed shortly after by the stunning Vitpilen 701, which the above image shows to have seemingly succeeded in the difficult task of taking a stunning motorcycle show concept and managing to get it through to production with minimal changes to the overall design. The normal process typically sees the dilution of the concept to the point where the production model is barely identifiable as the same bike. The Vitpilen 701 will use the single-cylinder motor from the KTM 690 Duke and will follow a year after the 401 and 125 models. These studio images show the bike in almost finished trim, and MCN sat down with lead designer Maxime Thouvenin to talk about how the project has been progressing and how tough it has been to try and keep the production bike as close as possible to the original 2013 concept bike. He said: “What we have tried to do is reduce the architecture to the minimum to leave just a fuel tank, tailpiece, wheels and the engine. The line built into the 701 is called ‘The Split’ and we are keeping that for production. In terms of the stance and the proportions, the concept you see here is what the bike will look like. Clearly we are going to have some of the legal items like a licence plate and indicators but everything else is about there. Surely that internally fluted exhaust or that open air filter can’t be staying through to production? “The exhaust is something we are working on very hard right now,” admits Thouvenin. The modern retro scene is huge. Everyone wants a piece of the action with BMW, Triumph, Moto Guzzi, Yamaha and Honda all clamouring for sales success. With the 112-year history of Husqvarna this, surely, would have been the easiest route to have followed to relaunch Husqvarna’s road range? Eventually Husqvarna will offer a complete range of bikes from 125 to 1301cc, all sharing engines and main chassis platform with KTM to keep costs down. The 1301cc bike has been seen in very early and rough prototype stages but we know this bike is still another three years away from a showroom. That bike will use the 1301cc 185bhp V-twin from the KTM 1290 Super Duke R and will sit at the very top of the Husqvarna range. Below that will be a 390cc single cylinder and 800cc parallel twin currenty under development as a completely new engine.